and is listed in the "Who's Who in Authors". She is pleased to offer her books and CD set for sale on this site. 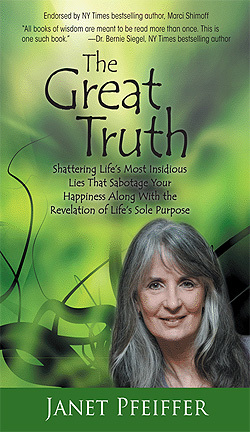 The Great Truth: Shattering Life’s Most Insidious Lies That Sabotage Your Happiness Along With the Revelation of Life’s Sole Purpose! While everything we’ve been taught has some degree of importance, the formula that defines who we are and what a successful, happy life consists of is tragically flawed. Everything we strive to attain has the potential to disappoint us and we become disenchanted with life. "All books of wisdom are meant to be read more than once. This is one such book." - Dr. Bernie Siegel, NY Times bestselling author, world-renowned medical doctor and mind/body/spirit leader. Or see Mail Order info at bottom of page. "Anger destroys millions of lives every day because people aren’t properly equipped to handle it." Most people don’t realize how angry they are. And yet anger destroys millions of lives every day because people aren’t properly equipped to handle it. 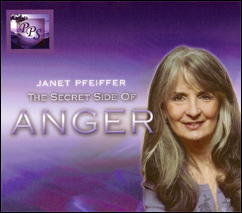 In The Secret Side of Anger, author Janet Pfeiffer reveals that anger itself isn’t the real issue. It is triggered by underlying emotions and problems that need to be addressed and resolved. Cleverly employing a practical and lighthearted approach, she provides simple yet effective techniques anyone can use to confront and release angry feelings that could potentially cause harm to the individual or others. Taken from her own personal life and more than twenty years of professional experience, Janet's insights and skills have helped tens of thousands of people. Janet learned about anger the hard way. 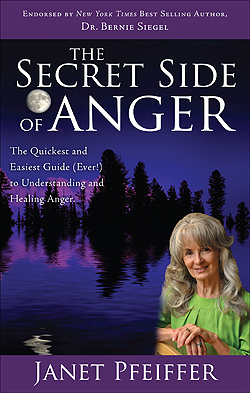 She wrote The Secret Side of Anger so you won’t have to. The Second Edition has revised as well as newly added chapters. 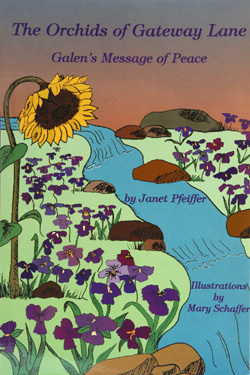 Endorsed by NY Times bestselling author, Dr. Bernie Siegel: "Janet Pfeiffer has written a book that can guide you on the path to a more peaceful and blessed life. Filled with deep wisdom, she shows you how to take charge of your thoughts and feelings, regain your personal power, and ultimately heal your wounds and your life." Even an Atheist Can Learn From This Book! I am a 28-year-old senior at Rutgers University. My grandmother, a devout Catholic, is an emphatic supporter of your book, The Secret Side of Anger. She has bought it for countless friends and associates and her family. Recently she purchased your book for me after a recent episode of anger caused a dramatic change to what I considered to be a near-perfect life with a near-perfect woman whom I still love. Now, the irony of course, is that I am an Atheist - emphatically so. Nonetheless, despite some of the heavier religious content in your book, I wanted you know that I've gone through it now in two days, blue penning countless passages, lines, and thumbing Post-It stickers to pages that stuck out to me. Through your book, I've come to understand that even the religious, who I have a tendency to look down upon (especially when their religion is thrown in my face), still have a great deal of wisdom to offer and valuable - hell, invaluable insight. In the past two days, I've learned a great deal about myself. Like I said, I may not agree with some of the religious content, but I can guarantee you I'll be walking away from this book a changed person, a better person, and with luck, become the kind of person that people want to gravitate toward, not keep their distance from. Hopefully, what I've learned can help restore the balance to my life. And even if it can't, it certainly has reminded me that I've endured a great deal in the past, and I can get through this. A future awaits me. 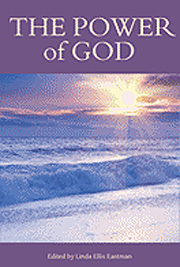 Written by Christian authors from the U.K., Jamaica, Zimbabwe, South Africa, the U.S.A., this book is filled with encouraging stories and uplifting spiritual words to fill the reader with deeper faith and closer relationship with God. The “60 Seconds With God” chapter, written by Janet Pfeiffer, speaks of a personal encounter with the Divine and how it transformed her life forever. This book is a must-read for Christians globally and is a perfect gift for your special Christian friends and family members. This 4 CD set is the easiest and most comprehensive guide ever in enabling individuals to significantly reduce their anger and frustration. Using everyday language, this unique step-by-step guide clearly uncovers little known facts about anger that are critical to managing if effectively. Readers will identify the core issues behind all anger, learn how to prevent others from pushing their buttons and regain their personal power. By implementing simple yet savvy strategies (such as “The Great Duck and Dishtowel Debate” and “TECO Magic”) readers will immediately notice a dramatic decrease in the amount, intensity and frequency of their anger. Based on years of personal and professional experience, this audio book is packed with practical knowledge and real-life examples of those who have triumphed over anger and reached a state of enlightenment and inner peace. Simple, practical, and easy to apply, this audio book is a must have for adults everywhere! 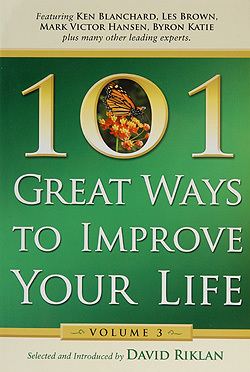 A compilation of 101 great lessons from some of today’s most prolific writers, including Mark Victor Hansen, Les Brown and more, this book is comprised of stories inspired to enrich the lives of those who read it. Janet Pfeiffer's contribution, “The Antidote to Anger: How to Calm an Angry Person and Turn Your Adversary Into Your Ally” shares four key principles of converting confrontation into cooperation. If you have ever encountered a hostile individual, the strategies in this chapter will illustrate the most effective way of soothing their anger and gaining their respect. 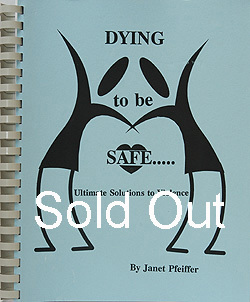 A character education type book, DYING TO BE SAFE is comprised of ten chapters focusing on instilling values and skills necessary to be successful in every aspect of life. From anger management and conflict resolution to communication and goal achievement, self-esteem and cognitive thinking and more, this book is filled with profound principles and more than thirty activities to support them. Games such as “The Great Duck and Dishtowel Debate”, “Little Shop of Humors”, “Raindrops Keep Falling on My Head”, and “The Making of a Superhero” are just a few. This is a perfect book for any parent or teacher. Sorry, this book is sold out. If you have ever had to deal with a difficult person or a bully, this story is for you. New to a school district, eleven year old RJ is teased and tormented by a gang of bullies. In an effort to escape the harassing, RJ retreats down a deserted dirt road on the way home from school one day and encounters a mystical woman named Galen who shares the secret of truly disarming a bully. This story follows RJ’s journey into adulthood and the unusual twist of events that occurs years later. The Orchids of Gateway Lane is both bittersweet and heartwarming in its ability to convey one of life’s most profound messages of creating lasting peace. Children and adults of every age need to hear Galen’s powerful message. 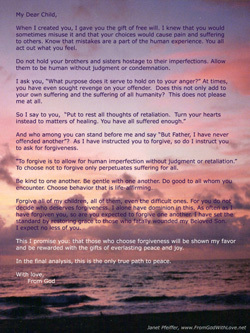 Life is rarely fair and many of us find ourselves becoming angry and resentful at times because of it. “Why is this happening to me?” “This is so unfair!” These are questions that have haunted most of us at one time or another. Yet as some point we all need to learn that regardless of what life hands us, we need to do the best we can with what we’ve got. In essence, life isn’t about what happens to you. It’s about what you choose to do with it once it does. 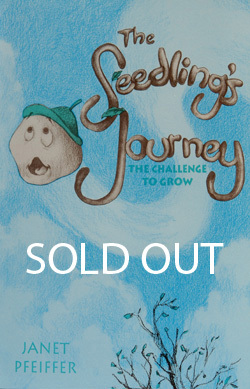 THE SEEDLING’S JOURNEY is an inspirational story about overcoming life’s unexpected challenges, turning obstacles into opportunities, and discovering one’s true purpose in life. Sorry, this book is sold out! Death: it’s a word few feel comfortable speaking. Yet it is an inevitable part of life that many people fear. I believe that death is a journey from this life to the next. 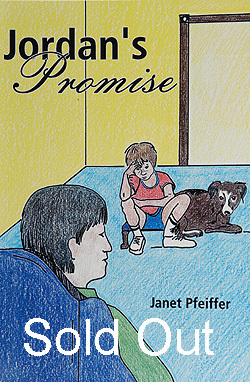 An inspirational and uplifting story of one family’s journey through loss, told through the eyes of one of the children, JORDAN’S PROMISE shares a message of hope and healing for those who are struggling through the darkness and pain. Anyone who has ever lost a loved one will find the message of this book uplifting and encouraging. Have you ever had something you truly loved but failed to give it the care it needed and ultimately ended up loosing it? Sadly, we’ve all made that mistake and then mourn what we no longer have – a personal belonging, our health, even a relationship. Sometimes we’re fortunate enough to be given another chance. But do we make the same mistakes again even though do we vowed to do things differently this time? 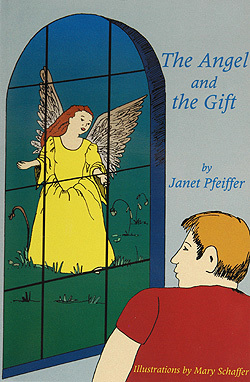 THE ANGEL AND THE GIFT is a modern day parable that illustrates the importance of giving tender care to our most cherished gifts – the people we love. Enjoy the video presentation, then purchase the poster! Size: 8.5" x 11" Perfect for framing! Check or Money Order only. Make check payable to Janet Pfeiffer in the proper amount. Be sure to include your full name, address, phone number and email address. Thank you and we sincerely hope you enjoy your purchase. We welcome any feedback.